A couple of weeks ago we had the final book club gathering of our first year. We discussed ‘All the light we cannot see’ written by Anthony Doerr. This book was my choice so I was eager to find out what my book club buddies thought about it… read on to find out! Marie Laure lives with her father in Paris within walking distance of the Museum of Natural History where he works as the master of the locks (there are thousands of locks in the museum). When she is six, she goes blind, and her father builds her a model of their neighbourhood, every house, every manhole, so she can memorize it with her fingers and navigate the real streets with her feet and cane. When the Germans occupy Paris, father and daughter flee to Saint-Malo on the Brittany coast, where Marie-Laure’s agoraphobic great uncle lives in a tall, narrow house by the sea wall. This book is divided into short chapters alternatively telling the story of Marie-Laure and Werner. Marie-Laure is a young French girl who turns blind when she’s 7 years old. She lives with her father in Paris. He teaches her how to cope with her blindness and she turns into an intelligent, independent young girl. At the age of 12, Marie-Laure and her father have to flee Paris because of the second World War. They go to Saint-Malo to live with her great-uncle and his housekeeper Madame Manec. One day, Marie-Laure’s dad is picked up and sent away. Marie-Laure stays in St-Malo together with her great-uncle and Madame Manec. Werner is a young German boy. He and his sister Jutta live in an orphanage. They are raised by Frau Elena who runs the orphanage and who really tries hard to give the children a good upbringing. One day, Werner and Jutta find a broken radio. He manages to make it and from then onward, they listen to their radio every night. They listen to a French scientist (they can understand French as Frau Elena is French) who teaches them a lot about the world of science. Werner is very clever and one day he fixes a radio from a German general. A bit later, Werner gets the chance to go to a school where he learns a great deal about mathematics and science, but also about becoming a soldier. These two stories then sometimes get interrupted by a third story, the story of August 1944, a flash forward. This is always quite a short part in the book, but it is very tense and thrilling because during this flash forward Marie-Laure is trapped in her house during the massive siege of St-Malo and Werner is trapped in a shelter under his hotel… also in St-Malo. At a certain point in the book all the stories come together. Because of the short chapters, because of Marie-Laure being blind, but especially because of the flash forwards, the tension really builds up and you just can’t put down the book! It reads like a train and the writing style is very fluent. Did you like reading this book? And what did you think about the style of writing Doerr uses? We all liked reading this novel. The story is well written and the tension builds up as the story progresses. This book reads like a train with its short chapters and fluent way of writing… but one of us however found the style of writing just a bit too smooth and too easy to her liking. What makes this book different than all the other books about the second World War? Doerr apparantly expects his readers to have a bit of knowledge of the second World War. He doesn’t go into political stuff and even the name Hitler isn’t mentioned that often. What makes this book so different though, is the fact that he tells both stories equally. You’ve got sympathy for both the vulnerable French girl ànd for the possibly even more vulnerable young German boy, the Nazi… who is supposed to be the bad guy. At the end of the book Doerr takes us to 1945, just after the war, but also to the 1970s. What striked me is how guilty the German women felt. The war may have been over in 1945, it definitely lived on for many decades in the lives of those who were part of it. Most of us liked Marie-Laure as she is a very intelligent, courageous, powerful, independent young woman… but of course she wouldn’t be who she is if it wasn’t for her dad! Frederick, a friend from Werner, was also a much loved character. We all felt sorry for him as he definitely didn’t feel at home at the school, but we guess he just didn’t have a choice! The same goes for Werner. What about the ‘the sea of flames’? Do you think it really protected Marie-Laure? Could a stone give protection? We’re all quite down to earth so we doubt it 🙂 However… Marie-Laure did survive whereas a lot of the people near her didn’t… so perhaps it did protect her? Can you relate to the way Doerr describes being blind? In what way does Marie-Laure and her father adept their lives when she becomes blind? There are a lot of things Marie-Laure’s father changes to make life easier for his daughter: he puts up a rope in the house she can follow to find her way, he puts her food in a certain way on her plate,… but most important of all: he makes a model of Paris and Saint-Malo for his daughter to find her way around these towns. Marie-Laure says that being blind is more than just closing your eyes as all your other senses are much more developed. when Marie-Laure says that everyone think she’s brave, but she says she just doesn’t have a choice to do otherwise. She wakes up and lives her life like anyone else. Personally I gave this book 9,25/10, the highest score I gave a book during our first year. Two other books were a 9/10 to me, but I think this one deserves that bit more, just because the story really touched me and it read so fluently! The average score of our bookclub was 8,46/10. Our next book club gathering is actually the kick-off of our second book club year! Here you can read the review of the first book we read for our book club! 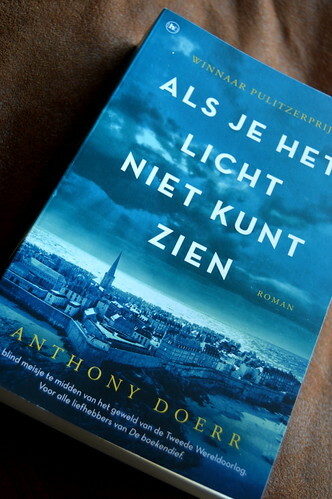 This entry was posted in The book club and tagged all the light we cannot see, anthony doerr, book, book club, book review. As someone who is blind, if I come across a blind character in a book, I always get distracted with questions like “is this realistic”, but this book sounds interesting and I will add it to my list! Thanks for sharing! I’ve added it to my library reading list! This book sounds wonderful. I had never heard of it before this, but after seeing how high you rated it, I might just have to check it out! I loved this book, especially the part where Marie Laure is hiding in the house in Saint Malo. It felt like I was there and I was scared for her. Only a very good book can get me to feel like that. I’m with you!!! This was such a good book, which got me from the first pages and indeed, the part where ML is in the house is so real. Fab writing!